It's surely worth giving you the quick heads up that, starting today, "the complete collection of Sir Arthur Conan Doyle's Sherlock Holmes tales, both long and short, have been compiled together for the first time." 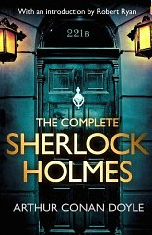 The Complete Sherlock Holmes (download it here) is free on the Kindle thanks to Simon & Schuster. Unlike many free texts, the formatting looks quite nice on my Kindle Paperwhite as well as on the iPad using the Free Kindle app. So, we're gladly adding this one to our collection of 375 Free eBooks, which gives you immediate access to many more classics. Shame, Amazon says it’s not available to Brazil due to licensing. It says “not available”… a country limitation(I’m in Venezuela) or something else? Well, there’s my answer… Jesus, it’s Sherlock Holmes, not the lastest Jonathan Franzen. It should be free of copyright. Hasta cuando? Shoot, sorry about that, we had no way of knowing that it’s not available outside of the US. If you look at the end of the post, I have included links to other versions of the stories available online. It’s been free on everything for a while. Just pirate it. It’s not like Arthur Conan Doyle is alive anymore and losing profit. There’s no need to feed money into copyright-mongers. There should be a spam filter for posts like this. Although Sherlock Holmes has been in the public domain for some time, this version does something worthwhile. It brings everything together in a very readable format and it’s easy to upload to a Kindle. That’s not the case with the other versions you can find on the web. I am in Canada and I was able to download it to my Kindle for Android app without any problem from Amazon, which is where your link took me. Thank you so much for this post.